Barry Lee is a name synonymous with Hot Rod Racing, but few people realise the full extent and diversity of his 60 years of competition. Respected by his peers and loved by the crowd, Barry thrilled and amused those he came into contact with, although sometimes his exuberant and independent personality was not appreciated by those in authority. This amusing, insightful and informative collection of stories unveils ‘the other side of Winning’ as told by Barry, his friends and rivals. Derek Bell: "I was out to win and did my utmost to beat him and the others, and to help Murray through his challenges. But Barry was on another level." Steve Parrish: "We both liked mucking about and got into all sorts of troubles, but it was always good fun ... I remember once when we were both racing for Mitchell Cox and we both nearly got fired." Rod Chapman: "In later years, Barry and I would compete together in truck racing. Not only is he extremely quick, he’s a very versatile driver and can seemingly drive anything with wheels." Murray Walker: "He is such an ebullient, friendly, go-getting chap and very determined too. He’s very forceful, says what he thinks, but is great to work with and quite the practical joker." 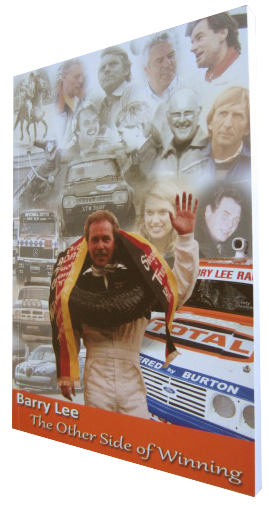 This 296 page colour paper-back contains many photographs, a foreword by Derek Warwick, and memories from: Bob Garrett, Bobby George, Barry Briggs MBE, Len Silver, Colin Pratt, ‘Jumping’ Jeff Williamson, Sonny Howard, Peter Purves, Rod Chapman, Martin Schanche, Malcolm Wilson OBE, Stuart Turner, Ari Vatanen, Bill Meade, Harry Carlton, Mick Jones, David Sutton, Barrie ‘Whizzo’ Williams, Graham Brown, Steve Burton, Nick Mason, George Polley, Mick ‘Duffy’ Collard, Colin Voyce, Steve Rider, Alf Drake, Dave Bartram, Brian McDonald, Alex Hawkridge, Alf Boarer, Murray Walker OBE, Mike Smith, Magnus Laird, Steve Parrish, Andrew Marriot, Steve Harris, Harold Blissett, Roger Hurrell, Matt James, Anneka Rice, Derek Bell MBE, Nigel Gibbard. This is a limited edtion print of 2000 which has sold really well so dont miss out and order your copy now! * UK Destination delivered by Royal Mail Signed-for 1st Class - 1 to 2 working days. EU destinations by Royal Mail International Signed-for - up to 5 working days. All other destinations Royal Mail International Signed-for - up to 7 working days.